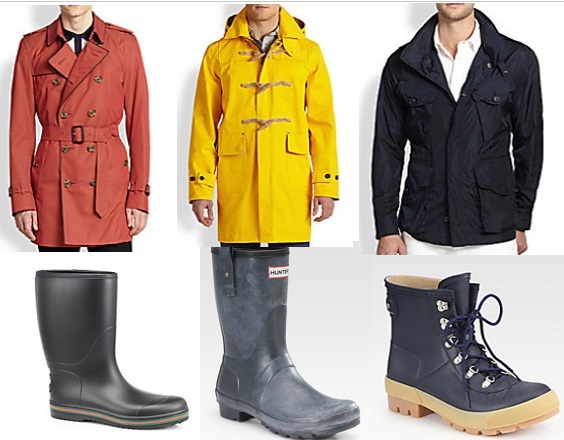 I cannot say this enough: rainy days are not an excuse to abandon fashion! When you wake up and check the weather in the morning, and see a forecast of rain, you should not automatically run to your closet and pick out your drabbest, dreariest, least stylish items and assemble them into an equally drab, dreary, style-deprived outfit. Instead, choose a stylish outfit that you would want to wear on any other day and add appropriate outwear items to shield yourself and your wardrobe from the elements. It is important that these items are seasonally appropriate, meaning that you probably should not be wearing the same outerwear in the months of April, May, and June as you had worn in the fall and winter months. In accordance with the weather, styles change also, meaning that the lined coats and thick rubber boots that served you well facing the winter elements are generally going to be too warm and heavy for the spring months. Additionally the spring demands a different color palette, one characterized by brighter, happier colors, even on days when the weather is less than cooperative. Here’s a bit of inspiration!